With the services of an Electrical Element Engineer at Win Technologies, you can be assured of professional technical backup in conjunction with our supply of EREMA Silicon Carbide furnace elements. EREMA (Electric REsistance MAterial) elements are produced by TKK in Japan.Â TKK have been manufacturing since 1936 and have developed world leading element production technology. EREMA stand apart from other brands in consistent quality, fine grained low porosity elements. The result is a stronger element which is slower to age = less downtime and lower annual element replacement costs overall. Ask for our test comparison charts on strength and ageing characteristics. Depending on type, most EREMA elements are supplied with new clamps and braids. This helps to ensure effective electrical contact, thus obtaining optimum element life. We can provide the following element types. These heating elements consist of fine, dense crystals. Because of their improved oxidation and heat resistance, as well as enhanced strength, products of this type are most widely used as economical heating elements applicable in a variety of atmospheres at high temperatures. Depending on the application, appropriate coats to resist oxidation and corrosion are used. 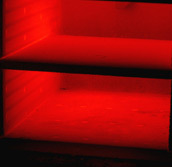 The heating section has features equivalent to those of D3-type products. Modification of terminal sections was made to decrease their resistance to make these products an energy saving type with low heat loss from terminals. Heating elements of this type have spiral grooves on their heating section and are given higher resistances to high temperature and corrosion than D3, E and F type products so as to withstand severe operating environments.Â The inner part of products with larger diameters can be used as a tube type furnace. 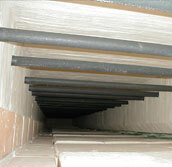 Terminal sections have been devised to provide low resistance, and have energy-saving properties as in E-type products. As in SG-type elements, spiral grooves are provided on the heating section with a terminal section on one side only.Â One side connection of the terminal allows for easier operation and facilitates construction of furnaces with energy saving structures.Â SG and SGR-type products are recommended for applications involving severe operating conditions including high furnace temperature ranges exceeding 1400 degrees Celsius. This type consists of two EREMA E (F) elements combined to form a U-shaped heating element.Â This is a single phase heating element with two terminal sections in one direction.Â With this product, furnaces of an energy saving construction can be built. Pin holes are optional.